Ok, so you think this seems a pretty obscure thing to synthesize, let alone post about as a tutorial? Well not really as this is a great example of how to create a pretty fair approximation of any sound you hear. Clones of Trance Leads and Phat Basses have been done to death but this approach to synthesis is not so commonly discussed. By deconstructing how the bits you hear make the total sound, you can build a passable version of the sound yourself. What a fascinating instrument. Don’t worry tho if it is no interest to you personally as what you learn here will work equally in copying TR-909 Kicks or Wub Basses. Absolutely first thing to learn to do as a synthesist (and musician) is to be able to hear the details. As a Fan, you hear the overall song/piece/sound. That is important as that is what the composer wants you to do. When you want to create your own painting using sound you need to consider the parts of the scene that you need to put on the canvas to create the picture in the mind of the Fan. If it was a man running then you could just say Ok I’ll whack in a couple of taps (clip, clop) and that will do. Not at all – unless your man is a clockwork horse in a jam jar. Your running man has to have a scene. Is he running from fear, running to a lover, running in the dark, fog…? The more you know the elements of the scene and their relative importance, the easier it is to paint them in. 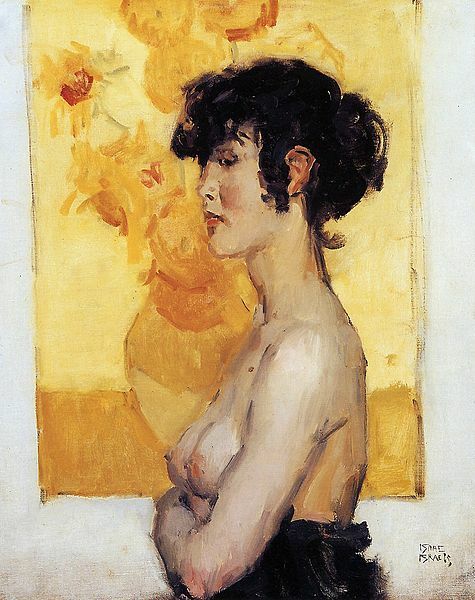 The key is to hear the details and know how to get them on the canvas. As a synthesis that is largely in creating the sound that will be played. Back to the Glass Armonica. This one gives us a head start as we can research the instrument in Wikipedia and even find a few more references and YouTube clips including recordings of quality performances. All worth at least dipping into as each provides a bit more detail to the picture. The sound is essentially a pure tone from the fingers on glass. The finger creates a “chiff” similar to a flute. Volume Swell and Vibrato are created by position & weight of the player’s fingers. The instrument creates a lot more complexity in harmonic structure. Some of this overtone series seems to spring from each “glass” or note. There are also a lot more harmonics in the sound and performance that very much appear to be sympathetic vibration as each sounding glass causes other glasses in the instrument to sound a tiny bit. This accounts for the slight discordance or disharmony that Wikipedia talks about as being a cause for “melancholia” in players of the instrument. Poppycock but it sure makes the instrument more challenging than say a piano or guitar which have more pleasing sympathetic vibration patterns. We could even get into the treadle or motor sound audible in the video but it didn’t seem to me that it would make any musical sense in most situations. They tell me there are sunflowers in this picture. Now that we have separated and understood the elements that we want in our patch we need to choose a synth to deliver these parts. This is very much the personal choice of the synthesist based on what instruments they have in their arsenal and how they want to deliver the elements. Just as a painter can make a million shades of yellow to paint sunflowers. I actually made two patches, the first using Propellerheads Parsec as it is an Additive synth and so naturally a bit more “glassy” in tone. 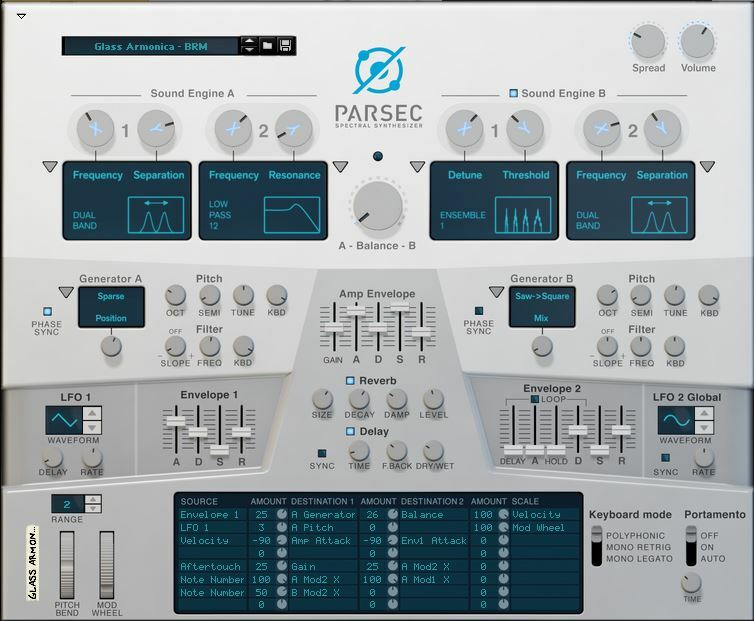 Parsec also responds to Aftertouch which let me play with the hand weight aspects. Ultimately though I wasn’t happy I had enough detail so turned back to my first-choice synth Thor. 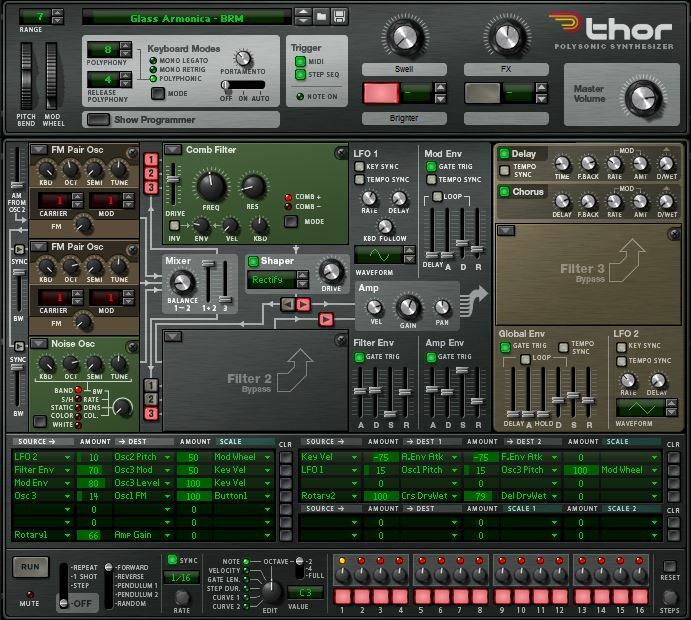 Thor has a big Mod Matrix coupled to a variety of OSC and Filter models which allows so much flexibility and control over detail. Also, I have used Thor so much I almost know it backwards (almost as it still surprises me). Pure Tone: A Sine Wave is the purest tone available so I start with one of them. Because the sound starts from a finger touching glass the duty-cycle of the wave will always start at the beginning of the wave (zero crossing as the wave rises) which makes one reason to choose the FM OSC over the free-running Analog OSC (there will be more reasons for this choice later). Chiff: The chiff is essentially noise so we could use White Noise but clearly the sound is more part of the tone structure. Thor’s Noise OSC has a great option for creating noise from a Sine. If you don’t have an OSC that does this then you can DIY by taking a Sine OSC and using a Noise source to modulate the pitch. More modulation equals more noise and less delivers a more tonal scraping sound which is exactly what is happening as finger meets glass. This chiff is relatively short so I used the Mod Env to control OSC 3 Volume. The chiff also varies over time so I borrowed (note that word) the Filter Env to create that movement. Again, that is our basic sound and usable but it lacks much of the variety of the real instrument which leaves it seeming pretty flat and simplistic (unless that is the very sound you want). Thor’s detail and Mod Matrix comes to the fore now as we can add performance control. Volume: Aftertouch is where a MIDI keyboard allows pressure on a depressed key to create a modulation. This is exactly what we see William Zeitler do in the video to create per-note volume variations and tremolo. Having ten fingers, the player can deliver different aftertouch for every note. This is called Polyphonic Aftertouch. Thor doesn’t have Polyphonic Aftertouch as a performance option so pressing one key harder into the key-bed makes the whole instrument get louder. I had used Aftertouch to provide volume swell on the Parsec patch but I don’t love Aftertouch myself so I thought I would try two alternate options. Thor allows per-note Velocity to control Volume which covers overall note volume and can control the note Attack duration in a way keyboard players are used to. For the Tremolo I assigned a Knob to volume Gain. For people with an Expression Pedal then assign that instead. I could have used an LFO and let the Knob control Mod Amount but a Pedal would provide more human tremolo shaping. My patch is best played with a light touch as I assume the Glass Armonica would. Adjust to your playing style. Vibrato: I am not 100% sure if or how vibrato is applied to the Glass Armonica but it seems it must be hand based. I have followed synth tradition here and used an LFO to create the pitch wobble source and assigned to Mod Wheel to control Mod Amount. Because I think pitching is to some extent controlled by the player’s hands I have left a bit of vibrato happening all the time. If I had wanted to be complex I could have assigned OSC Pitch to Velocity. Only a small amount to prevent serious out-of-tune-ness (this could be a possible solution to the next issues) OR I could have used the same concept as I talk about above with an Expression Pedal for a human-generated vibrato curve. Complex Harmonic Structure: The Glass Armonica is “open-box” so there is essentially no low-pass filtering going on here. However, the sound does interact with the environment and that is part of why I chose a Comb Filter. Like most instruments, there is a bit more complexity at the start of the note so I used the Filter Env to move the Filter at the note start. The more I listened to the sound the more I realize that in fact, this sound is very “dirty”. There is an awful lot more going on than a pure Sine wave tone. There are lots of overtones. Some of these harmonics are coming from the single glasses. The main overtone appears to be a few octaves above the Fundamental (played note). I am guessing here. I could have done what Giles Reeves (Selig) did in the thread and sampled a single wine glass and looked at that in a Spectrum Analyzer but I was just using my ears (and living in hope). Either way, I popped in OSC 2 and adjusted the OSC Mix. That helped but the real instrument is still a lot more complex than these two clean tones. There is a lot of harmonic mess excitifying this instrument. I figured that an FM OSC was a great way of adding the several layers of harmonics whilst keeping a glassy tone. I added just a tiny amount of FM to each OSC and then set the Noise OSC to dirty up OSC 1. If I did it again I would use OSC 2 to FM OSC 1. Subtle difference. Note here the overtones are kept quiet but add more depth and detail to the sound as it plays. Sympathetic Vibration: This is where synths really fail as every note is calculated separately and has no effect on other sounding notes. A guitar resonates every part of itself differently for every note or combination of notes struck. There is no easy way to handle this in synthesis. The best workable solution I have found is to use resonators like the “Body” section in the Scream Distortion unit. With care (and no overdrive) the resonator does a passable job of emulating a sense of the sounds interacting with each other. It still, however, can’t start vibrating un-played “glasses”. Ideas? The Room: Not noted above, but any instrument plays in some sort of space. Thor doesn’t have a Reverb but it does have Chorus and Delay effects. I have used Chorus more for stereo space and fullness so its level is lower than the Delay. The Delay here is short to mimic a reverb. I let the user control the amount of the effect so they can replace in the mix with other units or send effects. To help me finesse my sound I found a concert recording of a Mozart piece and the matching MIDI File (which I will say was not played with equal virtuosity as there was no volume or tremolo performance – tut, tut). If you have gotten this far and have a passable Glass Armonica then congratulations. You have probably learned a thing or three. What I really hope you have learned is to develop the ability to listen to something and start to understand how to separate the parts so you can put them back together in your favorite synthesizer. Remember this is like a painting as opposed to a photocopy. A synth will never really photocopy a real instrument, there is too much complexity, but what a synth sound can do is create a new instrument that is reminiscent of the target. Of course, this ability also allows you to hear sounds on record (CD, mp3 etc) and go a fair way to delivering that instrument in your own DAW. The most important thing here is to practice, practice, practice. Do this very consciously. Don’t just randomly twiddle knobs but deliberately note how twisting Knob A to the right progressively alters the sound. Move Knob B and see what that does. Then twist Knob A again to see how the changes in Knob B affect Knob A. At every point be aware of the changes and seek to understand why. Your brain will note all these things and over time will develop a vast database of entries and connections in your synthesist database. That is how you become a Master.